The Providence Bruins are set to open the season on Friday night with one of the league’s strongest rosters. The 2018-19 version of the P-Bruins is strong down the middle of the lineup card, with an abundance of talent. Jakob Forsbacka Karlsson will lead the way at center. 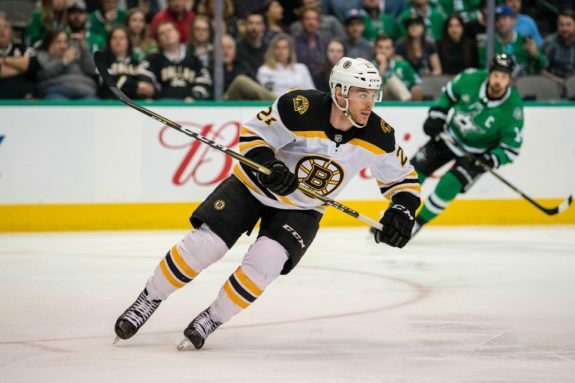 The Swede is entering his second season in the AHL coming off a legitimate battle for the third-line center role at training camp with the Boston Bruins. He’ll give the P-Bruins a versatile, smart, two-way center. Forsbacka Karlsson paired those strengths with a solid offensive showing in his first pro season in Providence with 15 goals and 17 assists for 32 points in 58 games. His numbers were promising and should improve as he matures. Another player battling with Forsbacka Karlsson for a position at center is Trent Frederic. The 2016 first-round pick made an immediate impact when he arrived in Providence at the end of his sophomore season in Wisconsin. Along with Mark McNeil, he brings size to the position, making the trio a tough squad to play against on a nightly basis. Veteran depth, in particular, makes this group stand out. McNeil and Jordan Szwarz have a lot of AHL experience. Szwarz is entering his third season in Providence after spending the first five years of his career in the Coyotes organization. Something clicked for Szwarz upon joining the P-Bruins in 2016-17. He put together back-to-back 20-goal seasons, after a previous career-high of 12, and he’s another reliable two-way player. With smart centers and a deep blue line, the P-Bruins will be able to control the play for long stretches of the game, spending limited time in their own zone. McNeil will be interesting to watch. The 18th overall pick by the Chicago Blackhawks in 2011 was never able to crack the Blackhawks’ lineup. Though he has yet to live up to expectations, he offers skill and size at 6-foot-2. The P-Bruins are hoping a change of scenery and stability might provide a spark for the 25-year-old, who hasn’t reached the 20-goal mark in the AHL since 2015-16 with Rockford. McNeill was traded mid-season last year, bouncing from the Texas Stars to the Milwaukee Admirals. He only spent a year and a half in the Stars organization, but will get a fresh start after landing with Boston this summer in free-agency. 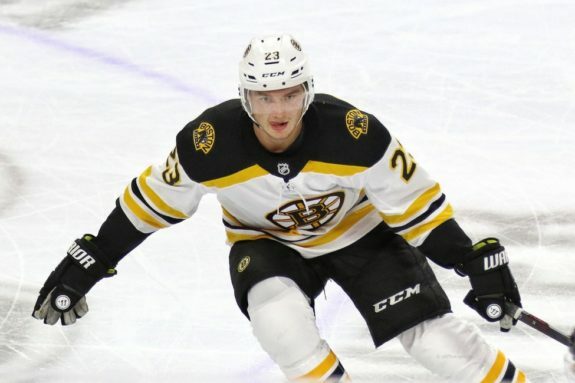 Colby Cave made his NHL debut in 2017-18, appearing in three games for the Bruins. Cave is a versatile, energetic forward that can play throughout the lineup in Providence. He’s a tremendous asset with the ever-changing rosters in the world of minor league hockey. Cave can kill penalties and will take some stress off the more skilled centers when needed. The team is so deep at center that someone of this group will likely end up on the wing. McNeil and Szwarz are capable of moving over, though the issue may work itself out when call-ups happen. It seems more likely a veteran shifts over to allow the younger centers to develop at the position. Don’t expect the young guys to be used out of position. The AHL is a development league and the P-Bruins are in a nice situation this year. The young guys are also truly the best options to have on the ice to win games. The team in Boston is in the business of winning and Frederic and Forsbacka Karlsson hung around for a long time at the NHL camp. They will continue to push for time as the season rolls along. The pieces are in place for this Providence team to be one of the better teams in the AHL. The organization has serious depth with the recent wave of young talent. Look for 2017 second-round pick Jack Studnicka to provide a late-season boost. He was given a long look at the Bruins’ training camp before he was returned to the OHL’s Oshawa Generals. Depending on what the roster looks like late in the season, he could either provide nice center depth for a playoff push or fill an immediate need. Depth usually helps minimize the impact of roster shuffling at the AHL level and Providence should be able to remain consistent when the inevitable injuries and call-ups strike. There’s no shortage of talent to keep things rolling at one of the most important positions.